MC Mong reigned supreme in Melon in the month if July. This song is really everywhere. I think it even competed with Super Junior in the top spot in Music Bank. But it’s a wonder why MC Mong never promoted it in music shows. Anyway, congrats to him and to this guy Mellow. The name kinda remind me of this character in Death Note. As expected, 2pm won last friday’s episode of Music Bank. It’s not really a shock since they have dominated the online charts and are number one in album sales this past week, according to Yesasia and Hanteo. I’m not sure however if they’ll win again this coming Friday. CL and Minji have been knocking on the doors and Park Bom seems to be moving up. Well, we just have to hope for the best for these boys. Here’s their performance in the said episode. I’m really loving the intro. So romantic and climactic. It’s just now that I notice that “Heartbeat” wasn’t the song that was competing with “Love Like This”. It was “Tired of Waiting”. Kinda weird that a promotional song is beaten by a song in the same album. 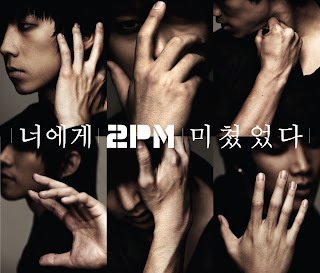 Anyway, I still really like “I Was Crazy About You” more than the rest of the songs in 2pm’s album. I hope they’ll promote it next. And hopefully this time, with Park Jaebeom. “Love Like This” is honestly growing on me. It is kind of a bubblegum pop. Like a male version of SNSD’s songs. But I’m still not a fan of the group. Maybe in time. Anyway, here are the rest of the chart. Here’s their performance in the said episode.